Tsukiko, thirty-eight, works in an office and lives alone. One night, she happens to meet one of her former high school teachers, “Sensei” in a local bar. Tsukiko had only ever called him “Sensei” (“Teacher”). He is thirty years her senior, retired, and presumably a widower. Their relationship traced by Kawakami’s gentle hints at the changing seasons develops from a perfunctory acknowledgment of each other as they eat and drink alone at the bar, to an enjoyable sense of companionship, and finally into a deeply sentimental love affair. This novel is a love story as only the Japanese can tell. It is lovely, and tender, and ultimately ephemerel, and it stays with the reader long after the book is finished. As always, upon finishing such a work, I am deeply moved. I’m looking forward to reading the thoughts of others, and I’m glad that I read this with Tony for the conclusion of January in Japan. As well as for the Japanese Literature Challenge 6. Find other thoughts from Tanabata, Tony, Stu, and Caroline. Next Post Farewell January, Hello February! Japanese Lit always leaves me with so much to think about after. I've really grown to appreciate these types of novels. This one sounds terrific to me. Thanks for sharing. This one sounds wonderful, Bellezza. I love books that stay with you long after you've finished. And, seriously, why is it called The Briefcase? That is such a weird name for a love story. 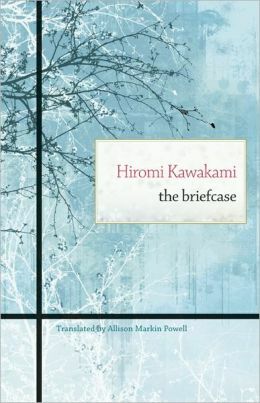 I am looking forward to joining Japanese Lit 6 and possibly reading this one. Looks very good. This one sounds so intriguing to me. I've not read any Japanese literature and am ashamed to say that. This could be a good starting point as the books seems straight forward. I liked it very much as well. It's so lovely. I hadn't thought of that interpretation of the title. This sounds like a beautiful story. I have to admit that I don't read a lot of work in translation – it is definitely something I should work on. I agree, Diane. More than any other kind of literature, Japanese creates an aura, or something to think about, long after the novel is finished. I'm going to have to go around to the other posts for this book which Tony hosted to see if I can find any answers. Some day, your list and my list will touch each other…from the US to the UK. The Japanese Literature Challenge 7 will be coming around this summer; sadly the JLC6 has just finished. But, there are so many titles from which to choose from posts people have left on the site! I do hope you'll join us, Harvee. Kathleen, I had not read any Japanese literature until six years ago. That's the great thing about blogging about books: a.) there's so much to discover and b.) there's nothing to be ashamed about! Isn't it beautiful, Stu? The writing, the mood, the story…all of it is just entrancing to me. I'm open to other intepretations, believe me! I'm never sure if the translations are spot on, but at least they make literature from other countries available to me, and for that I'm grateful. That sounds lovely. I always like Japanese fiction because it raises as many questions as it solves! Forces me to give my imagination a workout. For that reason, and the way that Japanese authors are able to create a mood, I'm so crazy about this genre.